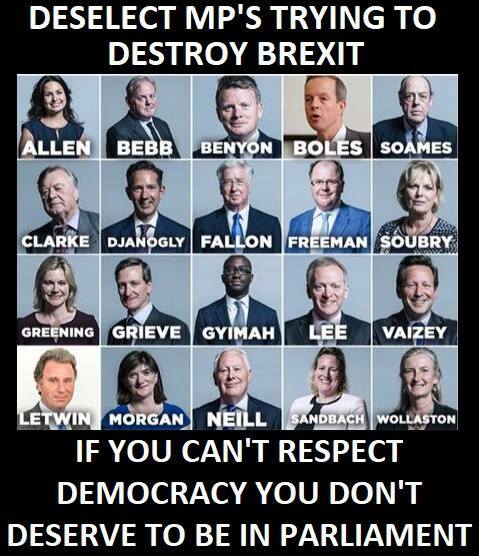 How to get your Remainer Tory MP deselected. If you live in one of the 23 constituencies that voted leave but have a Conservative MP who is supporting remain, here is how to get rid of them! 1) A Conservative MP who rejects the result of the Brexit referendum. 2) A Conservative MP who is reneging on the manifesto that they were elected on. 3) A Conservative MP who was selected by the local Conservative Association to be the Conservative candidate. Many people vote for a ‘party’ based on what they hear at the national level, and on the parties national manifesto. These voters trust the local association to put forward a candidate that will deliver on these national issues (as well as relevant local issues). Your local Conservative association have complete failed in this task, they have broken the trust of every voter in the constituency by delivering an MP who opposes the national will, opposes the constituencies will and opposes the will of the Conservative party. The local association cannot evade the responsibility they have for having tricked voters into electing a candidate who now rejects what they claimed to stand for at the time of election and now only stands for their own selfish interest. The local association must be left in no doubt that you hold them responsible for tricking you in this way, and that the very least they must do is show that they accept responsibility for their mistake by deselecting the MP as their candidate in the next and in all future elections. It would be a foolish person who trusted the associations selection of candidate in future, and a very, very foolish person to do so if they do not respond to this request to deselect the sitting MP as soon as the party rules allow. Conservative MP’s in Leave Constituencies who are supporting Remain.